today i had to pick up some Magnesium from Pharmaca... so while i was, i just had to look at the SpaRitual! i grabbed the polish i'm going to show you today and a two pack. although, i realized i only saved a penny by buying the two pack... so it's not exactly a great deal. we then headed over to Grandma's, had to eat at our favorite restaurant again, and we wanted my brother to meet the owner. all in all, a great day! 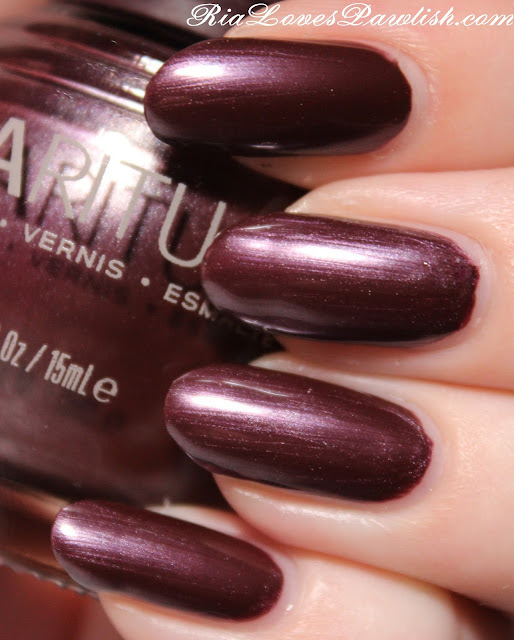 the single polish i picked up is SpaRitual Shrewd. it's a gorgeous taupey plum that is shot through with loads of pearly shimmer. it has a little bit of visible brushstrokes, but they aren't too bad. i really love the glow this polish has! the pearly shimmer gives it a lot of depth. the formula is great, two easy coats for full opacity. it's dries a bit dull, so a shine topcoat is pretty necessary! two coats Shrewd, one coat Seche Vite.